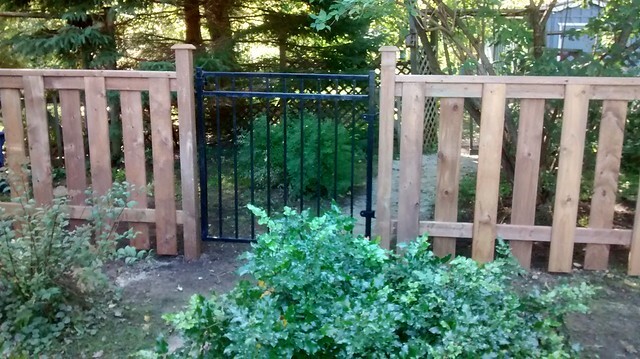 Below is the before picture looking west, where the flagstone path will intersect the line of the new fence and gate. in the background some of the old crappy fence can be seen. 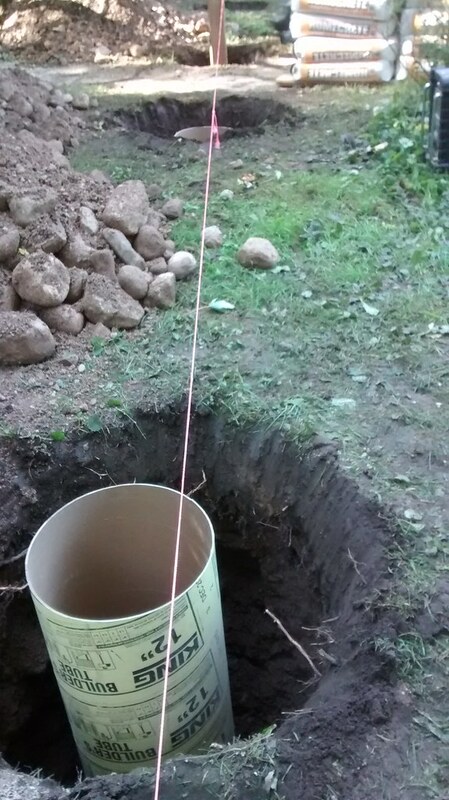 We did not tear that down yet, as we still needed to keep the dog contained. 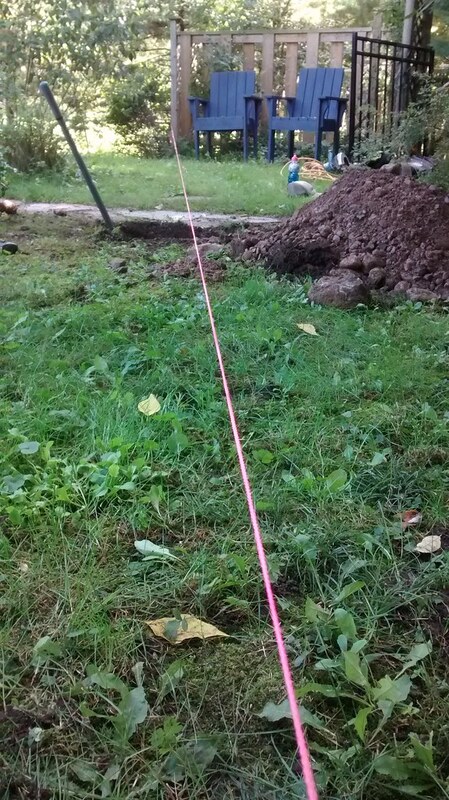 A string provides a reference to line up the holes. 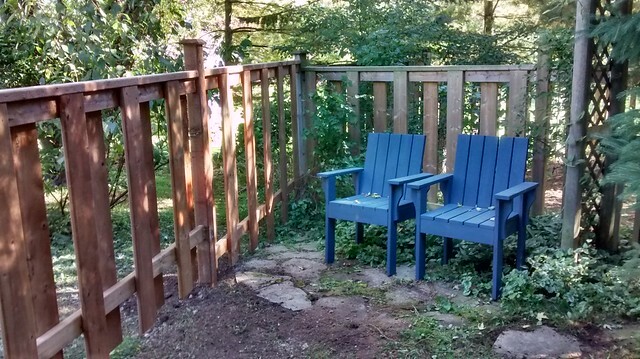 That short section of fence behind the blue chairs will remain, to define that corner, but it will no longer join the old crappy fence. 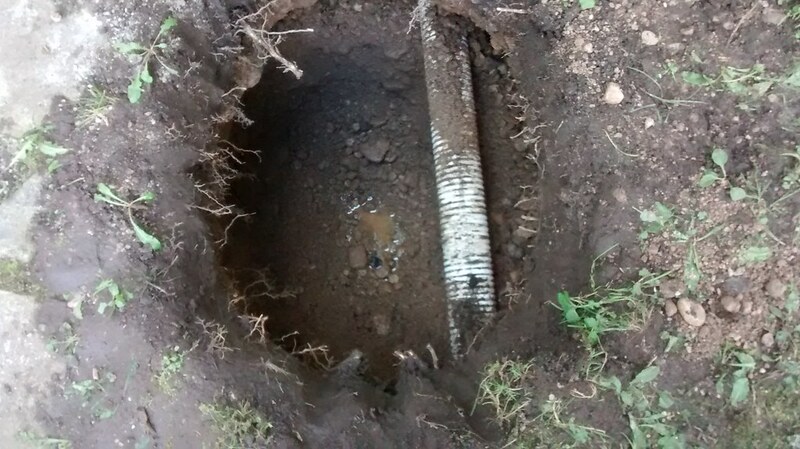 The first hole dug revealed a surprise: some kind of drainage pipe heading away from the house, probably coinnected to the weeping tile. We have never known of any drainage heading that way. 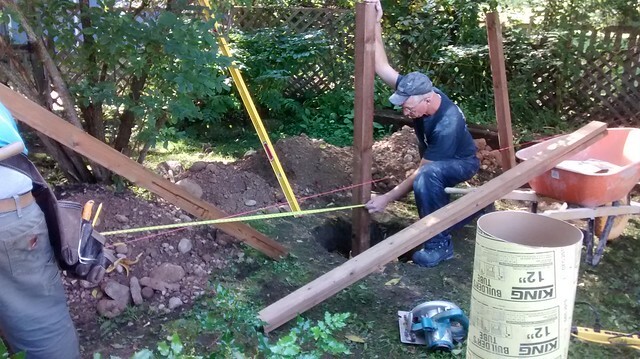 It made us need to adjust the post hole location a little, and in fact another of the holes revealed another drainage pipe, running parallel to the first. 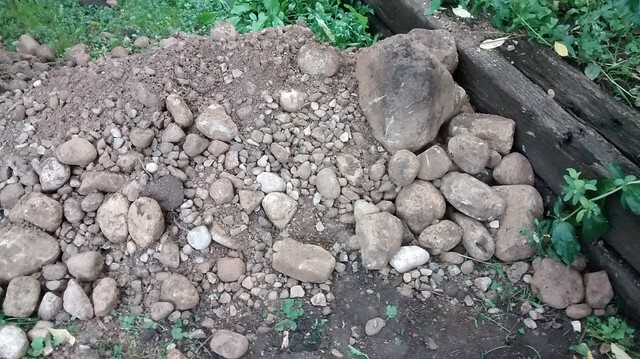 No wonder the Back 40 can get kind of soggy in the low spots. 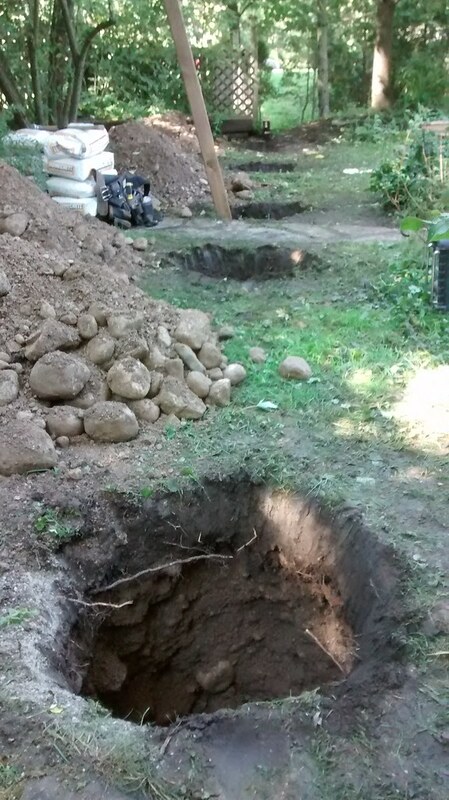 All holes finally dug, tubes in place ready for concrete. 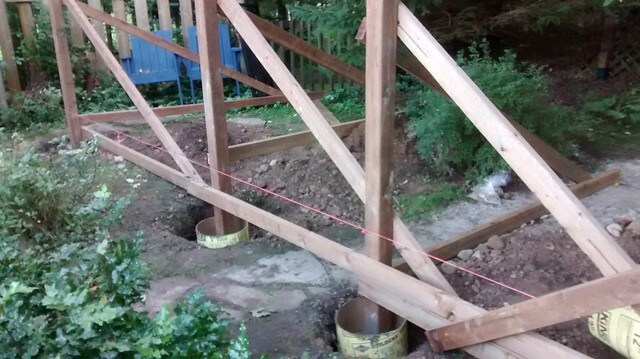 The posts need to be braced in two directions so they remain perfectly vertical as the concrete is poured. 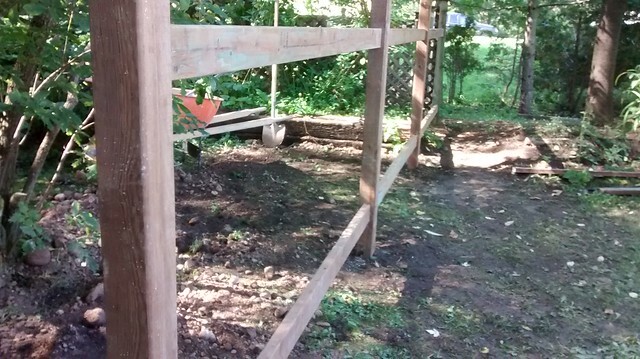 Once the concrete sets and the braces come off, next come the rails. 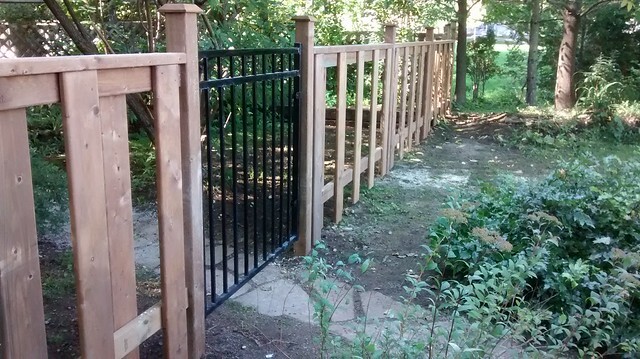 Rails, top caps, fence boards, post caps, install the gate, and we are DONE! 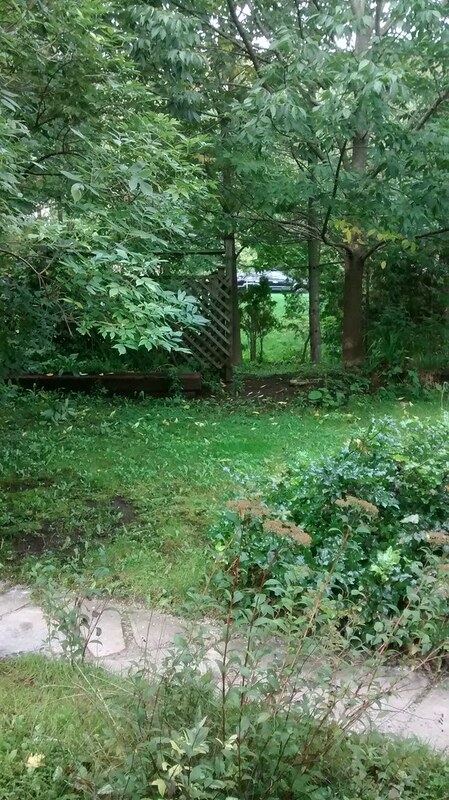 This entry was posted in Around the House, Photography, Woodworking on October 7, 2016 by admin. 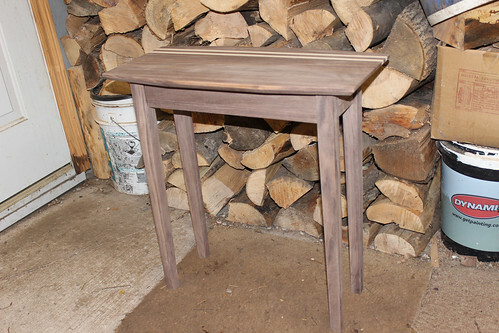 Finally finished finishing the finish on this small table for the front hall entry area of the house. 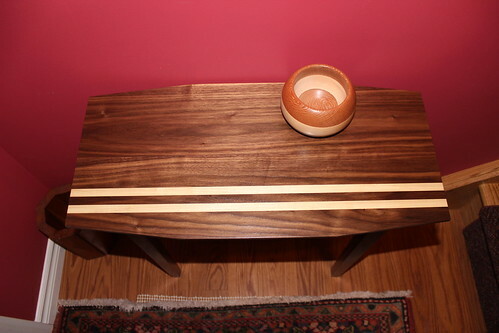 The table is made of walnut with maple racing stripes for speed and agility. Standard mortise and tenon joinery was used. 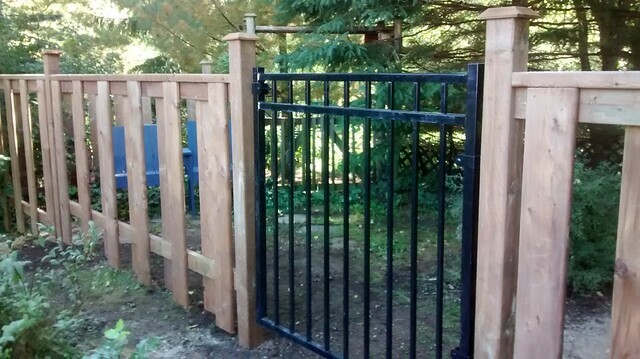 The finish is about 4-6 coats of Minwax Wipe-On Poly (more on the top). The shape of the top is kind of a modified octagon. Octagons are a bit of a theme around here: there’s a small octagonal window above the front door, the front garden bed is octagonal. There’s even an octagonal planter (or small umbrella stand) pictured on the floor there in the corner. 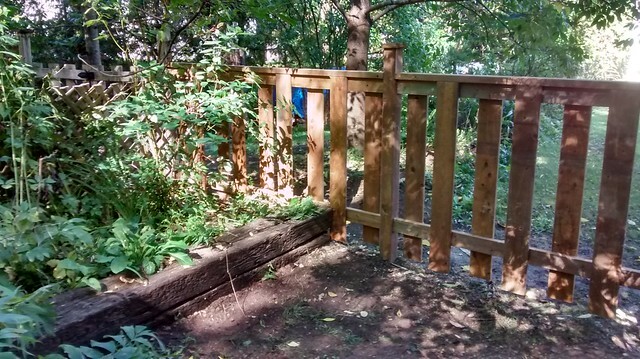 I’ve been dawdling over this one all summer, nice to see it finally done. 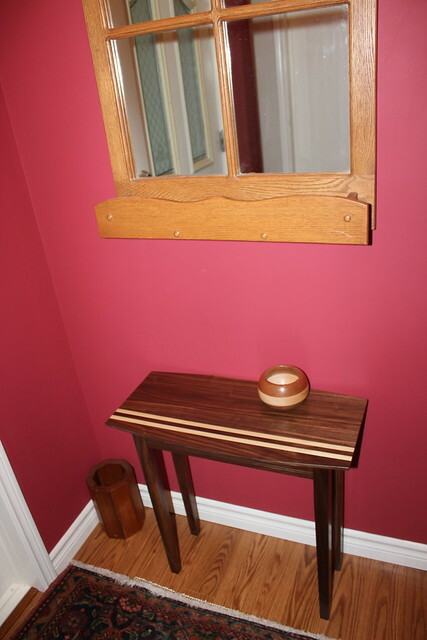 This entry was posted in Woodworking on November 1, 2013 by admin. A small table for the front hall, this has not yet had any finish applied, and the top is not yet attached, but otherwise it’s done! Finally. I’ve been dithering over this one, both design and execution, for many weeks. This is its last stop in the shop before coming inside for final cleanup and finishing. Lynda suggested the stripes would look better at the front, an idea I’m warming to. Don’t have to make that decision until I attach the top, though, which will be the very last thing. I do think the legs at the back in this view look a bit better facing forward. 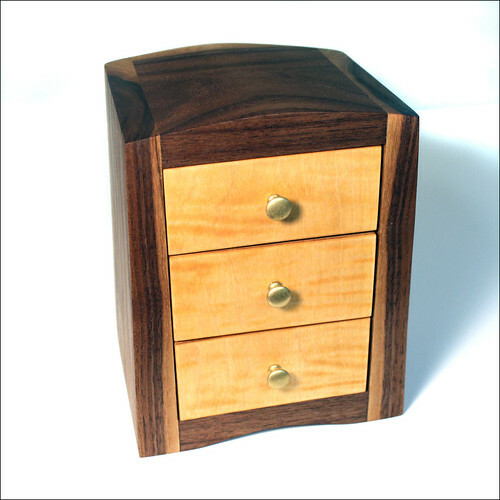 This entry was posted in Woodworking on October 27, 2013 by admin. 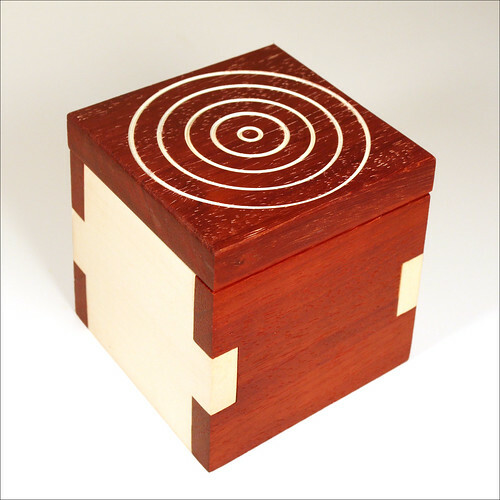 I made this small box (about 4.5 inches) from padauk and holly. The circle pattern was done on the lathe, then I spray-painted the whole lid. When it dried I scraped off the paint that wasn’t safely down in the circle grooves. Some paint stayed in the small pores of the wood as well, but that looked cool to my eye, so I went along with it. 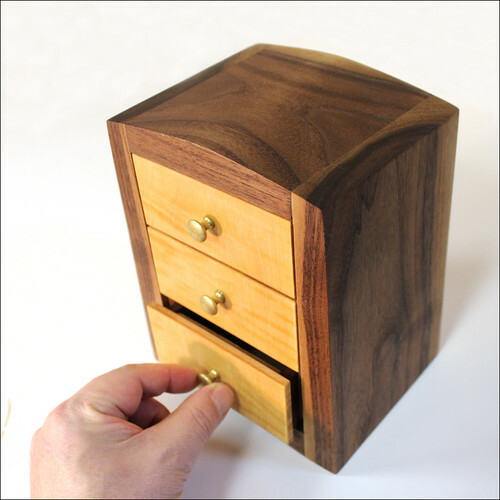 This entry was posted in Woodworking on August 31, 2013 by admin. This is a small spice grinder, the last of the kits I got a while back. Saving this one for me, I think. I changed the shape a little from the other ones, seems to work for my hand. 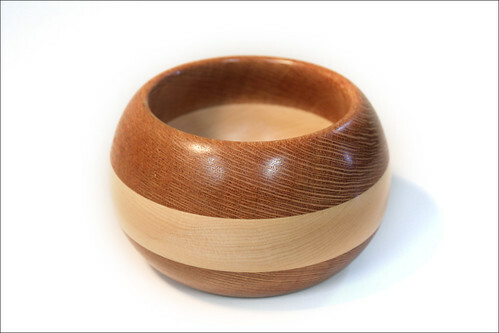 It’s made from some of my dwindling stock of figured bubinga, with a holly stripe. 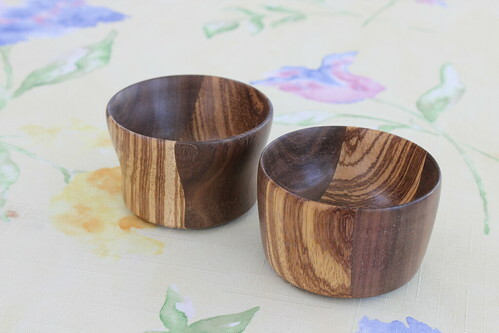 I didn’t want to waste any of that lovely figured bubinga, so with offcuts from preparing the blank for the bubinga spice grinder, I made these teeny tiny bubinga bowls. I like to say “bubinga”. 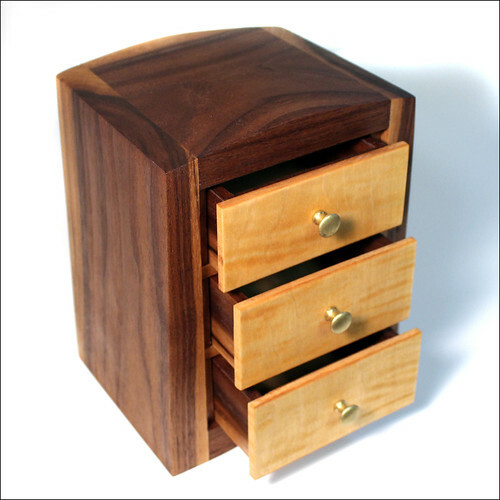 This entry was posted in Woodworking on April 20, 2013 by admin. I just made these three little tiny things. 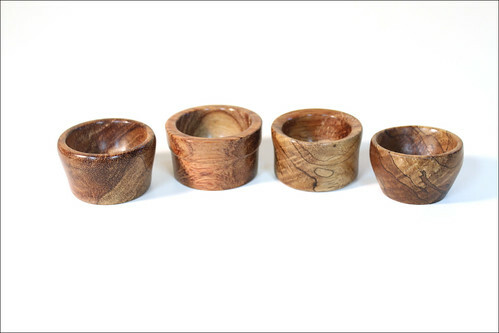 I’m calling them “treens” here, but they don’t have lids, so maybe they’re bowls. 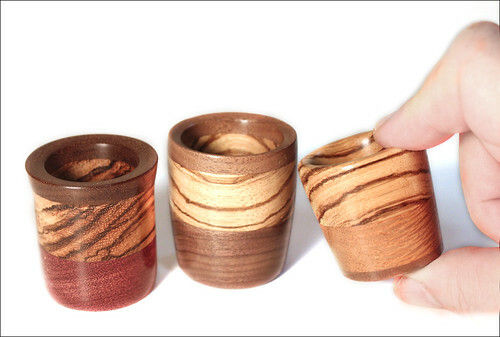 They kinda look like shot glasses. Okay, this is as small a bowl as anybody would need, outside of the dollhouse market I guess. It’s just under an inch high, and about an inch and a quarter across. Just BARELY holds two small earrings. The earrings belong to my wife, who came out with a rare “can I have it?” Another happy customer, especially as I gave it to her for free. 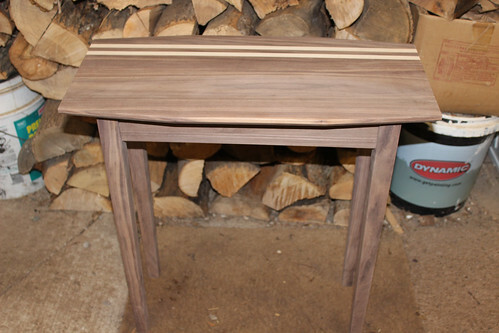 This entry was posted in Woodworking on April 14, 2013 by admin. I just made this sturdy little bowl from a sandwich of Lacewood and Maple, from the same stock as the two recent grinders. It’s about three inches tall, and just under 5 inches across at the equator. 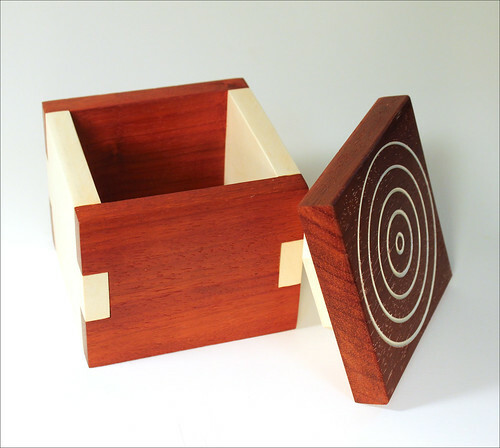 This entry was posted in Woodworking on April 5, 2013 by admin. 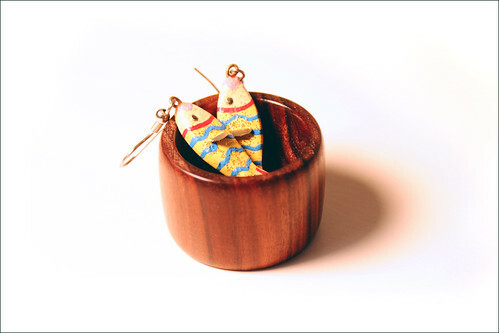 I made a couple more of these tiny wee bowls today. 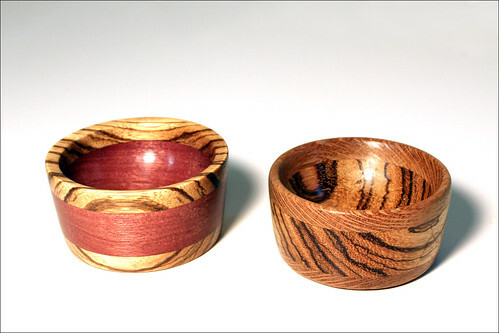 About three inches across, the one on the left is purpleheart sandwiched by zebrawood, the one on the right is zebrawood sandwiched by lacewood. Two More Tiny Wee Bowls, originally uploaded by rgdaniel. Tiny Wee Bowls, originally uploaded by rgdaniel. This entry was posted in Uncategorized, Woodworking on April 1, 2013 by admin. 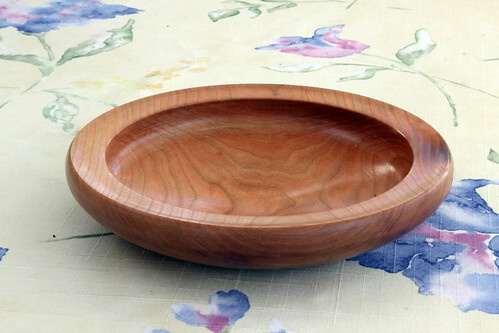 This shallow bowl (or deep dish, I suppose) is about 7 inches in diameter, and made of cherry wood. 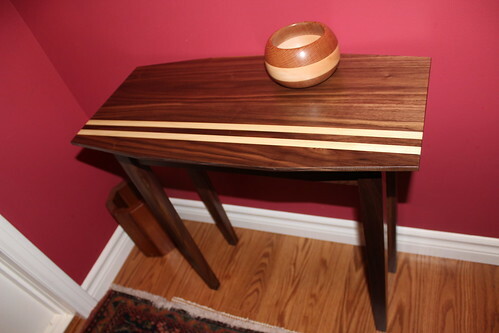 This entry was posted in Woodworking on March 30, 2013 by admin. This is a 3-drawer box I just made, mostly walnut with figured maple drawer fronts. The design is from The Box Builder’s Handbook by A.J.Hamler, which I more or less stuck to in this case. 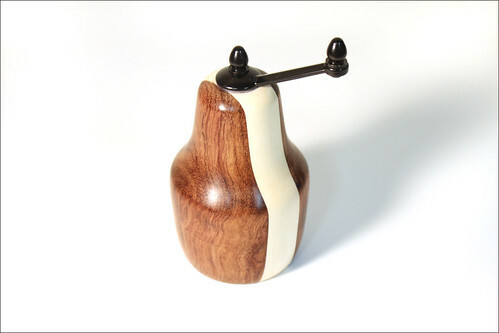 I was happy I could incorporate the sapwood of the walnut (the lighter parts) in a pleasing way. I will probably add flocking to the drawer bottoms, but otherwise it’s done. So what’s next? 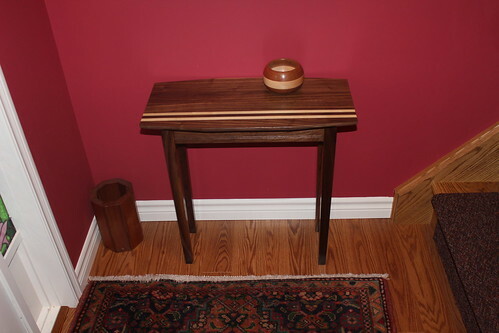 This entry was posted in Woodworking on March 21, 2013 by admin.